Since our last report on the disputed Republic of Kosovo, news has broken on two more U.N. member countries recognizing Kosovan independence. The first, the Democratic Republic of São Tomé and Príncipe, recognized the self-declared European republic on March 13 (before our last article, but the news didn't trickle out in time to include it). São Tomé and Príncipe is a tiny, Portuguese-speaking island country located off the western coast of Africa. The second recognition came just one week ago, on April 25, from the state of Brunei Darussalam ("Brunei" for short), a small kingdom located on the island of Borneo in Southeast Asia. Kosovo is now recognized by 90 U.N. member countries (46% of the total 193), as well as non-member Taiwan. 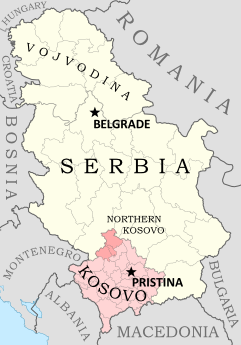 The Republic of Kosovo has not been admitted as a member of the U.N.
2012-4-25. "Brunei Darussalam recognizes Kosovo independence". Ministry of Foreign Affairs of the Republic of Kosovo.